Few things can light up your day better than the opportunity to win lots of money from a fun slots game. 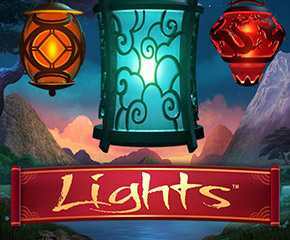 Lights is out to do just that with its offering of lanterns from the Far East that comes to you from one of the best game developers in the online casino game. Lights was developed by the same company that is responsible for some of the biggest hits in slot games, such as Reel Rush, Stickers, etc. NetEnt is a Scandinavian company that is famous for its great game build and design, and you know that these games are bound to have some of the best features out there. 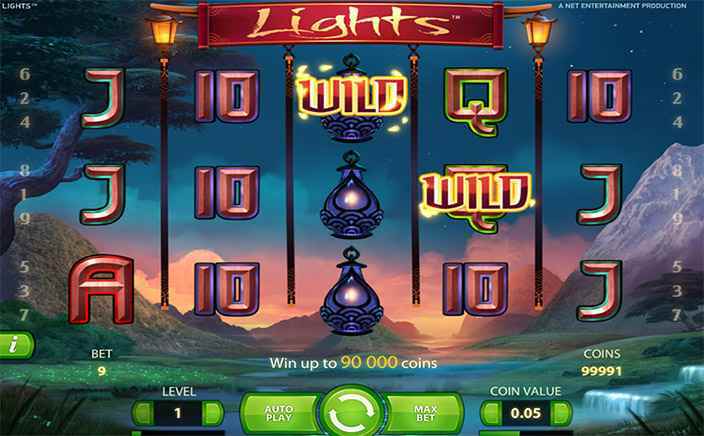 Lights is a 5 reel, 3 row and 9 payline video slot game that has its theme as an Oriental lamp and lantern display. These are set against a soothing background with cool background music to put your mind in the right frame for some good old slot action. To start playing, just place your wager and click the Spin button, and watch what the reels have to offer you. Floating wilds: Every time you spin the reels, you will see clouds of fireflies flying out of the reels and turning into floating wild symbols. Anywhere between two to four of these symbols can cover the entire reel with floating wild symbols so that you can make more winning paylines. Floating wilds substitute for other symbols on the reels to make up a winning payline and you can therefore make a lot of money in this way. Free spins: The game’s scatter symbol is a Yin and yang sign. When you get three or more of these on the reels, you activate the free spins round. 3 yin-yang symbols give you 10 free spins, 4 yin-yang symbols give you 20 free spins and 5 yin-yang symbols give you 30 free spins. If you activate the floating wilds feature during the game’s free spins round, you can get as many as six floating wilds on the reels. Lights is a medium variance slot game that is pleasant to play and soothing as well. The game’s floating wilds feature is certainly different and is great for making more cash on your win. That, coupled with the free spins round is something to look forward to if you just want to relax and try to win lots of money. It’s a highly recommended game if you are not looking to wager too much on the reels, so you can try your luck on this for some extra fun.